A unique research expedition is in progress in the Baltic Sea Region. Marine biologists are attempting to understand the influence that the countless water eddies have upon the sea’s nutrition and energy inventory. 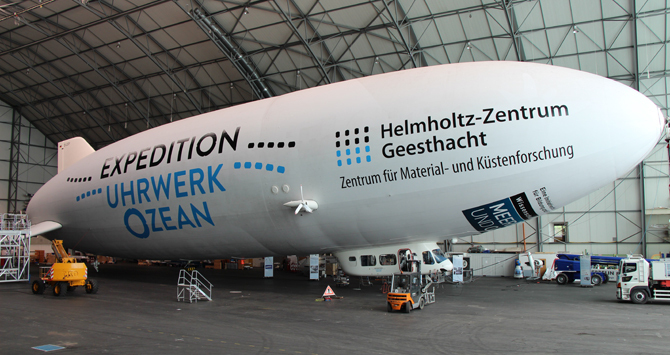 Here, for the first time in coastal and marine research, a zeppelin has been deployed. The goal of the expedition ‘Clockwork Ocean’ is to track down small, near-surface gyres with a dimension of 100 metres to 10 kilometres, and to measure such characteristics as their life cycle, dimensions, and temperature distribution. Thus far, research scientists hardly know more about these short-lived gyres than the fact that they exist in huge quantities. They want to understand what the gyres signify for ocean circulation, global climate, and the production of microalgae. The centrepiece of this 12-day expedition is a 75-metre-long zeppelin, equipped with special cameras. It is intended to track down the gyres and can, as opposed to previously deployed research aircraft, make observations while hovering directly above them. The researchers are able to observe how, among other things, the cold, nutrition-rich water at the core of the gyre mixes with the outlying water, and how microalgae reacts to it. They speculate that the small sea gyres have a none-too-insignificant influence on energy transport and microalgae production in the planet’s oceans. The latter is germane, since the microscopically-sized algae are at the beginning of the marine food-chain. “The small sea gyres still represent one of the big mysteries of oceanography,” explains Burkard Baschek from the Helmholtz-Zentrum Geesthacht. Baschek will lead the expedition, in which more than 40 oceanographers are taking part. In addition to the Helmholtz Centre, the Leibniz Institute for Baltic Sea Research Warnemünde (IOW), the University of Lübeck, the Alfred Wegener Institute Helmholtz Centre for Polar and Marine Research in Bremerhaven (AWI) as well as the Naval Research Laboratory and the Woods Hole Oceanographic Institution in the USA are also involved in the expedition.